WELCOME It's great to see you again! 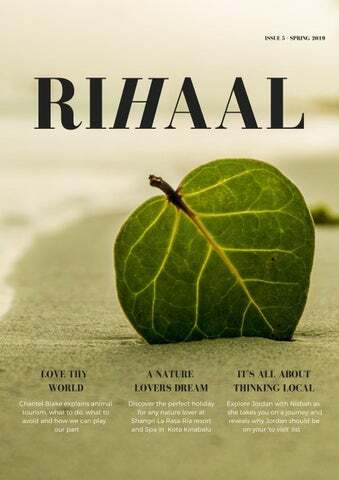 Welcome to the Spring edition of Rihaal! We're back with another issue of inspiring destinations, travel news, and why responsible travel should on the tip of your tongue. Join us as we travel with Nisbah to Jordan and the Shangri La Rasa Ria in Malaysia, as she explains why the two destinations should be on your travel list! Chantal will help us open our eyes on the importance of understanding animal tourism, and Amber will give you a run for your money with the latest Eco friendly products in this edition of Checklist. Your usual favourites, Hangar One, Cabin Fever, Gadget Geek, City By Taste (it's all about vegan food this time!) and The Man in Seat 1A are ready to provide you with the latest news, airline upgrades, gadgets, and food! So, what are you waiting for? Sit back, relax, and enjoy Rihaal's Spring edition. Game Changer: Qatar Airways reveals it's enhanced economy class. ZAHIR MOSQUE Situated in central Alor Sertar, Kedah, Malaysia, the beautiful Zahir Mosque stands. Being the state mosque of Kedah, it is used primarily by local Muslims and is the venue for the annual Qur'an reading competition. Known as one of the grandest and oldest mosques in Malaysia, the Zahir Mosque has been voted as one of the top 10 most beautiful mosques in the world. Built in 1912, the design was inspired by the vision of the late Sultan Muhammad Jiwa Zainal Abidin II. The Zahir Mosques has 5 large, black domes which symbolizes the Five Pillars of Islam, and is also the burial site for the Kedah warriors who died while defending the state from the Siamese in 1821. HANGAR ONE Japan launches the Fuji Excursion: A direct ride to the top Mt Fuji is one of Japan's most incredible natural wonders, and a popular tourist spot for visitors when exploring Japan. For previous travelers wanting to visit Mt Fuji, this meant enduring a tiring trek or switching trains, something that became confusing for some. However, the recently launched Fuji Excursion provides the perfect solution. The Fuji Excursion is a 2 hour direct train ride to the very top. The journey will run twice on weekdays and three time during the weekends, making it an effortless trip with the advantages of the panoramic city views. Unexpected guests at Serendipity Beach! Soneva Jani is expecting the arrival of up to 100 baby sea turtles this April. These hatchlings are the offspring of a green sea turtle that visited the island on the night of February 14. Throughout the night she dug over 25 different holes for over seven hours. At last, she was able to lay and safeguard her eggs on Soneva Janiâ&#x20AC;&#x2122;s shores. Ellie, Soneva Janiâ&#x20AC;&#x2122;s Marine Biologist, watched over the turtle throughout her time on the island. The beach that the Green Turtle chose as the location for her nest had previously been unnamed. To commemorate her visit and the arrival of her hatchlings the beach has been named Serendipity Beach! Who can say no to Ferrero? It's a chocolate that so many people love, and it's now becoming halal certified! Familyowned Italian chocolate company Ferrero has said that 33 of its products and 19 of its plants are already halal-certified, a number that is set to grow. According to the company, in the next 2-3 years, Ferrero, who operates 25 plants, plan to make all factories halal friendly. Flying Economy: The seats of the future Get ready for the future of flying economy. British design company LAYER has devised a prototype seat, designed for use in Airbus economy cabins on short to mid-haul flights, that promises to deliver heightened comfort levels. The concept of the seat that has been dubbed "Move", uses built-in smart sensors which allow passengers to manually control the seat temperature, tenstion, pressure, and movement, all from an app they can download on their phone. The stylish design not only looks modern, but the technology behind it is too. Easily enjoy a massage with its massage setting, get alerted when it's time to get up and stretch your legs, or reminded when a device is left inside its special pocket which fits both laptops and tablets. These premium economy seats include 38 inches of legroom, foot rests, and adjustable headrests, allowing the ultimate comfort for any economy flying passenger. The launch of the MSC Bellissima At the beginning of March, MSC Cruises, the leading cruise line in Europe officially welcomed the latest addition to the Companyâ&#x20AC;&#x2122;s modern fleet - MSC Bellissima. The Companyâ&#x20AC;&#x2122;s new flagship was named in a glamourous and traditional maritime Naming Ceremony in the port of Southampton. MSC Bellissima will be fitted with a large number of environmental features and innovative technology to reduce her environmental footprint, while also offering luxurious accommodations spanning three decks, private facilities and butler service round-the-clock. MSC Bellissima will spend her inaugural season in the Mediterranean offering 7-night cruises to some of the regionâ&#x20AC;&#x2122;s most popular ports before moving to the Emirates for Winter 2019/2020. Following that she will be deployed in Asia in 2020. “Actually, the best gift you could have given her was a lifetime of adventures…” This quote from Lewis Carroll resonates and embodies my choices as a mother and my desire to ensure that my little adventurers are provided with hundreds of adventures, which I hope will shape them to become global citizens. An important aspect of being global citizens is ensuring that we try and be as responsible in our travel as possible. On our recent visit to Jordan we realised that the country was a great example of how we as travellers can choose to travel responsibly in different ways, which will really benefit countries they visit and their communities. The image synonymous with Jordan is Petra and whilst this is still a major pull for tourists and rightly so, the country is literally overflowing with incredible sights, experiences and will leave any visitor totally in awe and planning on their return trip even before they leave. So what are the issues with Jordan and how can we help? TOURISM SLUMP Located in the Middle East, Jordan borders a number of war torn countries that has sadly resulted in Jordan’s tourism being greatly affected. Over the last decade tourist numbers had slumped to some of the lowest for years. Only in 2017 did the number of visitors to places like Petra increase for the first time in 8 years. This slump in tourism coincided with a period in the travel industry that saw global travel in general becoming more accessible, cheaper and attainable. With this increase in global travel the decline in visitors to Jordan has been a really shame as the country has so much to offer every type of traveller. HOW SAFE IS JORDAN? This question remains one of the most goggled when tourists are looking at visiting Jordan. We are family travellers and before adventuring anywhere with young children you need to have the peace of mind that you are not unnecessarily endangering the lives of your children. Having spent 10 days in Jordan and having explored significant areas throughout I can safely (mind the pun) say there were no issues at all in many of the major touristy parts of the country. We felt safe to walk around the major cities, tourist sites and even walk around at night with our children in tow. There is army presence throughout the country but they were always welcoming to the children and made us feel safer rather than threatened. HOW CAN TOURISTS REALLY HELP? Responsible travel is much more than just the environmental impact we have on the countries we visit. Responsible travel encapsulates us ensuring that as tourists we are putting back into the global economy in a multitude of ways, which will really impact at the heart of communities. With nearly 8% of Jordan’s GDP being derived from the tourism industry, the first and easiest way of travelling responsibly is by returning or adding a visit to Jordan to our travel bucket lists. By visiting the country again we not only help bolster its economy, it helps to raise awareness that the country is still safe to visit and help overcome misconceptions that some travellers may have. Whilst in Jordan instead of using big tour companies and western tour organisations we chose to travel and use local guides, taxis and businesses. We are aware that a single family’s travel will not ease the issues but these small steps will continue to make a difference. This coupled with the looks of appreciation and smiles you will receive from locals in return are truly priceless. Speaking as someone who has travelled extensively, travelling with a local is always a much more enlightening experience, you will find the spots that other tourists miss, the real treasures and hidden gems in the country and it makes an adventure even more meaningful. One aspect of travel we always encourage our little adventurers to do is to buy from local people. Even if the products they are selling aren’t the glitziest, they tend to be made with lots more love and care. By spending our money with locals it will help feed, clothe and make a difference to a family which we want and need our children to understand is much more important than having the fully polished trinkets from the larger stores. WHY SHOULD YOU VISIT JORDAN? What I can say about Jordan except is that it is truly a country with everything, and whatever you decide to do, whichever direction you choose in which to travel it will be an incredible experience. With UNESCO sights, natural wonders, religious sites and historical wonders and adventures in abundance, it is an adventure packed country! countries we need to strive to visit. our little adventurers to climb over canyons, to the tops of crazy stone mounds and running through the desert. QATAR AIRWAYS UNVEILS ITS ENHANCED ECONOMY CLASS PRODUCT Qatar Airways stole the limelight on the opening day of ITB Berlin, the world’s largest international travel and tourism trade show, as the airline’s Group Chief Executive, His Excellency Mr. Akbar Al Baker, revealed the airline’s new Economy Class experience and announced seven upcoming additions to its rapidly-growing global network. The unveiling ceremony, which took place on Wednesday 6 March, the first day of the show, was attended by the Qatari Ambassador to Germany, His Excellency Sheikh Saoud Bin Abdulrahman Al Thani and the Mayor of Berlin, Mr. Michael Müller. Qatar Airways’ new Economy Class experience features a seat with an innovative 19-degree recline system, additional legroom, dual trays, 13.3-inch 4 K widescreens and type ‘C’ fast charging USB port. The airline’s new in-flight dining experience ‘Quisine’, truly redefines Economy Class service, with all new retail-style tableware, a menu offering more choices, 25 per cent larger main courses, 20 per cent larger appetisers, and 50 per cent larger desserts. The airline is especially pleased to be ‘going green with Quisine’, as the new Economy Class proposition sees a significant increase in rotable, recyclable and biodegradable products and reduction in single-use plastic. Economy Class passengers will also be able to enjoy improved connectivity, including up to 10 times faster broadband, as well as more than 4,000 entertainment options on Qatar Airways’ Oryx One in-flight entertainment system. Qatar Airways Group Chief Executive, His Excellency Mr. Akbar Al Baker, said: “We are very pleased to reveal our new Economy Class experience here at ITB, proving that our commitment to providing the very finest experience extends to all of our passengers, not only those in Premium class. Our new Economy Class seat, with its redesigned recline system and additional leg room, will ensure that our passengers in Economy Class arrive at their destinations feeling rested and refreshed. We invite all visitors to ITB to visit our stand, so that they can experience this unique product for themselves. At the press conference attended by nearly 200 members of the media, H.E. Mr. Al Baker also revealed an array of forthcoming global destinations the airline will launch in 2019, including Lisbon, Portugal; Malta; Rabat, Morocco; Langkawi, Malaysia; Davao, Philippines; Izmir, Turkey; and Mogadishu, Somalia. Travel brings the distant and unfamiliar within reach. Countries, cultures, and wildlife are brought vividly into view when setting foot in a new terrain. In ‘exotic’ destinations, for example, you may be offered opportunities to ride elephants, swim with dolphins, or stroke tigers without fear of danger or attack. Such an offer entices tourists to do the unthinkable and boastfully share it on social media. But how do we responsibly interact with animal life? Halal travel upholds the Islamic values of eating permissible foods, avoiding forbidden activities, and observing the daily prayer. However, a deeper exploration of the faith reminds us of the need to be ethical in our interactions with all of God’s creation—including human, animals, and the environment. In the Islamic tradition, we can cite multiple instances where the Prophet Muhammad (peace be upon him) rebuked people for mistreating their pets, overburdening their riding beasts, and misusing animals for entertainment. Moreover, kindness and mercy shown to animals are praised and cited as a cause for Divine forgiveness and reward. So, let’s explore how we can uphold these Prophetic principles while bearing witness to the beauty and majesty of God’s creation. An animal, whether dwelling on land or sea, cannot organically reach its full growth and potential without the necessary challenges of survival in the wild. Zoos are helpful for breeding rare species, preventing extinction, and conducting conservation research. Unfortunately, some of the funds to do so are often generated by humiliating and painful entertainment as well as the observation of animal species outside of their natural habitat. Encounters that guarantee a specific interaction with animals are often the results of intense training, rehearsal, and domestication of wild animals. In countries with negligible animal rights legislature and enforcement and/or limited economic opportunities, animals in tourism are commodified as a tool to generate income and often suffer abuse. Similar to circuses and zoo performances, a manipulated relationship between animal, human, freedom, and sustenance must exist to make a wild animal willingly perform on cue at the behest of their trainer. Alternatively, animals may be drugged or overfed with the intent of suppressing their hunting instincts, so that unassuming tourists can pose and snuggle with carnivorous animals. entertainment, handling, or photo props. evident or concealed abuse or cruelty. reintroduced to the wild or a protected habitat. orangutans only during very limited feeding hours with no guarantee of a sighting. and spin in the air. noise, flash photography, and handling are prohibited during tours at the Ras al Jinz Turtle Reserve. The Mahouts Elephant Foundation rescues elephants from abusive labor camps and returns them to their natural environment. Additionally, the mahouts or elephant riders and trainers are given a living wage and a viable alternative to life in labor camps. Visitors are allowed to observe but not get too close to the elephants and vice versa. Other ethical animal tourism experiences can be much more immersive, such as gorilla trekking in Uganda, swimming in the Galapagos Islands, going to a giraffe sanctuary in Kenya, swimming with dwarf mink whales in Australia, visiting an ethical tiger sanctuary in India, and many others. What is most important is that we reexamine what we think of animals and find restorative and respectful ways to interact with them, just as Prophet Muhammad (peace be upon him) would. Preparing for a trip is always exciting and may head to the shops to purchase anything from miniature toiletries to new luggage sets, all while building a buzz about your upcoming trip. Below we have explored a few eco-friendly options to add to your travel shopping list. Check out our selection of high-quality products that will save you money, and the planet at the same time. For camping or hostels without a machine or dryer, or perhaps you don’t want another hotel bill, wash your clothes in the specially designed “Scruba”. All you have to do is add warm water and soap, rub sides together for just minutes. By creating friction with the clothes and washboards built into the bag you’ll quickly and easily have clean clothes. Samsonite, an established luggage company has recently created a new eco range of suitcases all made from recycled plastic bottles. In using 100% non- biodegradable old plastic to create these products, its repurposing and not contributing to the environmental plastic issue we face. Still a stylish brand for your dramatic airport sweep yet a sustainable purchase. Another must when taking a trip, a new toothbrush, which you’ll inevitable either leave in your hotel or throw away at the end of the trip. Why not make this small purchase, so you can throw it into the recycling rather than the landfill when you're done with it? A must when you travel, toiletries. Normally bought new and as expensive miniatures, as cute as they are, they ’re expensive and waste further plastic. Why not transfer those you already have at home into these reusable containers? Save yourself the money and the world some plastic bottles. Available very cheaply in sets that can fit a range of products such as shampoo, make up, soap and more. On the first morning of our stay, I set my alarm for a 5am start. Rather blurry eyed, my niece and I went to join the other guests and we embarked on our walk through the forest to have breakfast at the lookout. It was a great way to kick-start a morning of adventures, taking on the steep walk through the rainforest and canopies to reach the lookout. The group was joined by two forest rangers that spent lots of their time relaying information of all the things we were seeing as we trekked our way to the lookout. One thing that was apparent from the rangers was the sheer passion for the work they were doing and helping to preserve nature for our future generations. As a huge fan of the outdoors, it was truly infectious. As we arrived at the lookout we were greeted with a gorgeous picnic set up in the middle of a forest clearing with stunning views of the ocean, beach and surrounding areas. As we sat down to eat, we had a little furry friend join us for the breakfast which after my initial shock (coupled with a scream or two) made the whole experience even more fun and ensured we were kept on our toes! The breakfast experience was rustic, chic but totally in keeping with the resorts eco friendly theme. The Rasa Ria resort offers so many additional daily activities with the focus and commitment to nature. One thing I really loved was that despite being a 5 star resort the prices for the activities were really well priced and meant families could try a whole range of activities without it becoming an onerous additional cost to their stay. The highlights in the programme that I loved in addition to the breakfast at the lookout and junior rangers programme was the bird watching at the lookout and the night walk in the forest with night vision goggles. I loved the fact that the hotel was combining both technology and nature to ensure guests had an immersive and amazing experience. Three times a week the rangers have an additional free creepy crawlies evening session for guests. For intrepid little adventurers it was fabulous to see the incredible creatures up and close, and the ranger provided amazing facts and insights to the animals and plants which all lived in the forest just outside N O Mwhere A D I C we | 2were 4 meeting. Whilst responsible travel and commitment to preserve and develop the natural surroundings were a major pull for me, the Shangri la Rasa Ria was an incredible resort in so many ways and the ideal hotel for families to experience the joys of travel. With incredible facilities from amazing pools and water slides to golf courses to a fabulous spa, guests are treated to everything you would expect from a 5 star hotel and more. For families and even those with young children, there was a kids pool which has its own canopy and lots of nice touches which showed that the guests were the central focus of the hotel. During our stay we stayed in the Ocean Wing, which to the delight of our little adventurers had an outdoor bath and direct access to the grounds and beach. The hotel was not surprisingly home to a range of amazing restaurants. The highlight for our little adventurers was breakfast time. Not only was the breakfast buffet one of the most varied and extensive we have ever come across, the daily enchantment was the traditional Borneo tea ceremony which saw tea being moved from one cup to another in the most fun, fast paced and awesome way. During our stay we tried the award winning Italian, the laid back golf restaurant, which serve the most incredible and humongous burgers. The last night of our stay proved to be the ideal way to finish an incredible trip. The guests were entertained with traditional dances from Malaysia and Borneo and it culminated in our little adventurers being asked to come onto the stage and try and join into the dance. Our youngest little adventurer was only aged 3 at the time and they were so amazing. The pictures at the end, to this date, remain some of my favourites from our travels. The Shangri la Rasa Ria is without a doubt a truly luxurious hotel, but their focus on responsible, nature based travel experiences coupled with lots of family friendly features again highlights that children should never be a restricting factor for travel. It is just a matter of finding the incredible hotels around the world which understand N O M A D I C and | 24 provide for the needs of families in unique and wonderful ways. Being the beautiful country it is, and home to some of nature's most popular and breathtaking tourist spots, Norway continues to play their part in ensuring their countries beauty is well maintained. Apart from looking after their selves, Norway also plays a big part in contributing to an environmentally friendly planet. The thrift/reuse culture is big in Norway. School books are reused, and are passed on from child to child. Recycling is another major project in Norway, which has led them to have one of the most efficient recycling plans in the world. Norway also has an ambitious plan of creating electric airplanes by 2020, while they have shown a huge growing interest in electric vehicles. Late last year it was estimate that 50% of the vehicles registered in Norway are electric. Supermarkets are currently doing their part by using recycled or paper bags, and because of this, it is hoped that by 2020, the use of plastic in Norway’s case is expected to drop by 1,260 tons. Other projects Norway have strongly implemented are the 'Seed Vault', emission-free fjords, fighting food waste, and 'Plogging', waste collecting in forests. NATURE AT IT'S BEST Being a strong believer in keeping things Eco-friendly, guests to Norway can expect to experience some of the cleanest air the world has to offer. The nature-packed country offers an outdoor playgrounds for adventure lovers with plenty of mountains to hike and ski, a ton of cycling paths to venture through, and plenty of fishing, canoeing, kayaking, and other Ecofriendly past times. The Netherlands is working hard to reduce carbon emissions, reduce air pollution, clean up their rivers, and improve waste management. Over the last 20 year, the coutnry have had a National Envionrment Policy Plan in place, and have since met over 70% of their goals! With more than 15,000 kilometers (9,320 miles) of bike paths, the Netherlands main mode of transportation is via bike. A country that has held their ground when it comes to being Ecofriendly, Iceland has made it one of their top prioritiesÂ to utilize its natural geothermal resources for heat and electricity production, alongside fighting against ocean pollution. and instilling sustainable fishing practices. Costa Rica Costa Rica stands strong as the forefront of the eco-tourism and travel movement. This beautiful Central American country has protected roughly 25% of its territory as national parks and biological reserves, is using 95% renewable energy sources within the country, and is working to become the first carbon-neutral country by 2021. Australia Australia may be fairly new to taking action, but with several plans in place to reduce carbon emissions, they plan to have 1/5th of Australia’s energy come from solar, wind, and geothermal sources by 2020. Australia is also a strong believe in promoting programs to reduce the country's carbon footprint. Azores Islands An archipelago of nine islands located 1,288 kilometers off the coast of Portugal in the Atlantic Ocean, the Azores, have maintained a laid-back and environmentallyconscious way of life. With no towering resorts, and almost all food being locally sourced, this small destination is determined to stay Eco-friendly! NURTURING NEW ZEALAND Known for its picturesque landscape, and beautiful nature, New Zealand is on a mission to be completely free from fossil fuels by 2025. Being diverse in landscape, ecosystems, and wildlife, New Zealand has been promoting Eco-tourism alongside playing their part in making the world a greener place. To set an example for tourists, many of New Zealand's travel and tourism organizations carry the Green Globe seal, or the Green Globe administers certification to businesses that meet sustainability standards. The Global Sustainable Tourism Criteria is the international benchmark for ecotourism, and is something many of New Zealand'sÂ organizations are proudly part off. Tourist that book with companies that carry the Green Globe seal know they too are helping make the world a better place. Mauritius The paradise getaway known for it's pristine beaches, colorful reefs, and luscious lagoons. Welcome to Mauritius, your halal friendly holiday in one of earth's most tropical escapes. Situted in the Indian Ocean, Mauritius is almost entirely surrounded by coral reefs. With 177km or coastline, most of which is covered by white, sandy beaches, this sunny destination is the perfect spot for travelers looking to enjoy the 'good life'. Offering such a wealth of natural beauty and exciting activities for travelers, Mauritius has become a popular holiday getaway for travelers of all ages, and for a mixture of occasions. The unique natural features Mauritius has to offer includes two UNESCO World Heritage status monuments, the 7-Coloured Earths of Chamarel, and the Black River Gorges. There are plenty of marine activities and adventures waiting for nature lovers to explore with scuba diving, snorkeling, kite surfing, trekking in the lush forests and biking around the island being some of the most popular. history to be discovered, and a fascinating, vibrant culture to enjoy. Mauritius is home to a variety of exotic and coloful religious festivals, many which tourist can take part in. Shopping centres and nature reserves where you can spot some of the native endangered species are also popular among tourist. DID YOU KNOW? Despite being extinct, the Dodo bird is a something we're pretty sure you've heard of. This extinct flightless bird disappeared so quickly off the face of earth 300 years ago that it has become the poster bird for extinction. Home to Mauritius, and until the modern era, the dodo had led a charmed life on the island.Â There were no predatory mammals, reptiles, or even large insects on its island habitat and thus no need to evolve any natural defenses. Because of this, when European setters arrived, the dodo birth happily approached not knowing the fate mandkind had in store for them. MAURITIUS ISLAND Mauritius is a tropical island paradise and arguably Africa's wealthiest destination. It is one of the world's most luxurious tourism destination with a selection of 5* hotels and resorts from all over the world. Offering a warm tropical climate, clear warm seas, welcoming beaches, tropical fauna, and a multi-ethnic and cultural population, Mauritius has easily won the World Leading Island Destination award three times, as well as the World's Best Beach award. THE PEOPLE OF MAURITIUS Mauritians, the people or Mauritius are a colorful mix of races. With their forefathers coming from Africa, Europe, India, and Asia, the mixed population of just over 1.27 million creates a warm and friendly welcoming to tourist from all over the globe. Most Mauritians will speak at least two or three languages such as French, Bhojpuri, Creole, Hindi or, Cantonese. You may also notice a divide in occupation with the Asian Mauritians working in commerce, the Indo Mauritians in agriculture, and the French Mauritians take charge of tourism, banking, and manufacturing sectors. VISITING MAURITIUS If you plan on making Mauritius your next destination stop, it's best to visit in their summer or during the months of November to May. With calmer winds and sunny days, the overall weather is more reliable than of what it is during the winter. However, if you're not one for too much heare, and are looking for milder temperatures and stronger winds fir kite-surfing and water sports, then visiting during the winter is more suitable. When possible, make an effort to walk or ride a bike instead of driving a care. This avoids carbon emissions completely. Take public transportation also drastically reduces the CO2 emissions by spreading them out over many riders. If you're financially able to, consider getting solar panels fitted to the roof of your home. By using solar panels to create electricity, no greenhouse gas emissions are released into the atmosphere. Only cook what you can eat! Be conscious when preparing and cooking meals. Instead of throwing out leftovers, reheat it or make another meal out of it. Reducing your food waste means you won't need to make as many trips to the store too! GO ECONOMY CLASS This may come as a surprise, but flying business class is responsible for almost three times as many emissions as economy because in economy, the flightâ&#x20AC;&#x2122;s carbon emissions are shared among more passengers. No one wants to get stuck in traffic. Apart from wasting your time and fuel, being stuck in traffic creates unneccessarily CO2. To avoid this, try to use traffic websites and apps and go a different route or simply wait! Reduce your water usage and don't waste water! Turn the tap/shower off when brushing your teeth/applying soap. You can also buy low flow shower and faucet heads, water efficient washing machines and dishwashers. DO AN ENERGY AUDIT Perform an energy audit on your home as often as you can. This will allow you to know how you use and waste your home's energy. By carrying out an energy audit you'll be able to identify ways to be more energy efficient. SUPPORT, EDUCATE, SPREAD AWARENESS Whenever you can, encourage and support greenhouse-reducing practices in your community. Advocate for cleaner alternatives to fossil fuels, or simply help spread awareness on why it's so important we reduce our carboon footprints! HaveÂ Your Organic Cake and Eat It. To ensure goodness, freshness and flavor, where possible the produce featured at Six Senses restaurants is sourced locally or cultivated in onsite organic gardens. The culinary and spa teams incorporate these natural aromatic plants into drinks and dishes, sauces, garnishes and spa treatments. EAT WITH SIX SENSES In 2017, Six Senses launched Eat With Six Senses, another pillar of the Six Senses Integrated Wellness philosophy and approach to food and drink – to ensure guests always leave feeling better than when they arrived. It is based on the guiding principles of natural ingredients, local and sustainable, and less is more, helping guests to reconnect with food safe in the knowledge that it’s good for them and good for the world around them. Chefs indulge their love for hearty and healthy menus full of color, taste and joy, while unapologetically avoiding the bad stuff (flavor enhancers, lectins, lactose, gluten and sugar). Instead they choose the ingredients and preparation methods that promote a healthy microbiome (the trillions of tiny gut buddies living in the body) to offer better digestion and absorption of nutrients while boosting the immune system. Eat With Six Senses also has a positive outcome on the hosts, as the philosophy has been implemented in all employee dining outlets. It creates an internal culture of health and wellness through healthier meal choices as well as providing knowledge to support the well-being of hosts and their families. AROUND THE WORLD IN 80 INGREDIENTS The onsite organic gardens at all Six Senses properties produce an array of herbs and seasonings such as lemongrass, chili, coriander and basil. In Vietnam at Six Senses Ninh Van Bay for example bananas, star fruit, green papaya, mango, beans, lettuce and eggplant are just some of the produce grown on site. Thailand’s Six Senses Yao Noi produces fresh organic eggs from its 200strong brood of free-range hens. Named the Egg-ceptional Farm, and complete with a den and playground, guests are invited to join in the daily egg collection. The resorts also have a new twist on drinking straws, replacing plastic with locally-grown lemongrass. Also in Thailand, Six Senses Samui features crisp hydroponic lettuce produced by farmers in the Mae-Nam area. And Evason Hua Hin has adopted a new direction by combining organic gardening using permaculture principles and an on-site recycling program. More than 11,000 date palms dot the grounds of Six Senses Zighy Bay in Oman, which are harvested for smoothies, snacks and spa scrubs. With its sights set on an even larger scale, the resort also operates an 18,000acre (7,300hectare) farm in nearby Dibba, and serves lobsters and fish that have just been caught by local Musandam fishermen. Fresh line-caught reef fish, tuna and seafood are the order of the day at Six Senses Laamu in the Maldives, included on the menus of all the resort’s restaurants. A team of 10 marine biologists are dedicated to marine conservation and engage with government and local fishermen to provide leadership on sustainable fishing practices. In the Seychelles, cuisine is an eclectic mix of cultures that have passed the shores over the centuries, and Six Senses Zil Payson draws from these diverse heritages. The organic garden supports the ultimate aim of selfsustained food and a range of specialty snacks are crafted around locally available coconuts. Engagement with marine conservation research ensures the freshest local fish is available for guests plus for future generations to enjoy. Much of the produce at Six Senses Douro Valley comes from the verdant valley and surrounding countryside. The resort boasts a well-established organic vegetable garden, curing center for meat and fish, and is developing an edible forest next to the grounds. No visit to the Douro Region is complete without learning about the historic wine production, and guests will benefit from strong relationships with exceptional local vineyards. The Alchemy Bar also delves into local herbs, fruits, Six Senses Water Program and spices to create entirely organic potions, scrubs, face and hair masks and much more. All Six Senses hotels and resorts produce their own high-quality drinking water, which does not come into contact with plastic after filtration. This eliminates the use of over 1 million plastic bottles each year. Alone or with family and friends, however you are travelling it’s always best to be prepared and safe, especially with a whole range of new experiences on the horizon. Wanting to put your adventures and immersing yourself in what’s to come as your main priority, we’ve put together a selection of thrifty and smart products that will have your safety taken care of during your travels. Whatever type of trip are about to embark upon, whether its thriving in the great outdoors to a cosy hotel city break to simple exploring a foreign country, we have it covered. With products such as the water safety kit, the portable door lock and offline maps to to make your trip care free knowing you and your possessions sound and secure. PORTABLE DOOR LOCK A Lock is always useful for luggage and lockers from hostels to sleeper trains. If you’re anything like me, you prefer not having the conductor burst in at 5 am telling you your approaching your stop. Instead, you’d rather a polite knock. With a portable door lock never worry about this again. Easily lock your doors on trains and overnight cabins, and relax as you rest peacefully knowing you and your belongings are safe. This tracker can be used for a selection of things. From your luggage, keys, or even your children, simply attach the tracker to the object and connect via Bluetooth on your phone. You can even share the tracker with friends when traveling together. If you and your friends are to get split up, you’ll be able to locate one and other with the tracker. The Bluetooth tracker is perfect for those with the habit of putting something down and completely forgetting where they left it. When you’re travelling remotely and need to check the water quality is safe to drink don’t take risks, where possible invest in safeguards for your beverages to check the contents. These tests relay to you if the water you’ve tested is safe and free of any harmful bacteria or content. This is a great purchase if you may be away from your comfort zone and need to rely on natural resources on your trip. With temperatures dropping below -20°C, it’s best to have a backup plan to keep you warm. Hand and toe warmers are an essential for those looking to climb Mt Kilimanjaro, and are a great way of keeping you on your feet. Despite the cold, a reliable set will provide you with enough heat to keep you comfortable and prevent your hands and feet from going numb. Investing in a reusable hand and toe warmer set is a great way of saving money as they can easily be reactivated for your next adventure by simply immersing them in boiling water. OFFLINE COMMUNICATION Always be prepared for the notification we all dread “no found network”. I’m not saying carry a walkie talkie, but some form of offline communication is important. Whether it be maps that work offline, or one of the newer offline apps which translate signs through your camera lens, having them ready will make your life a lot easier. Just simply texting works too. The majority of these apps are free to download, on both iPhone and android, and it never hurts to be prepared. Barcelona - Rasoterra Carrer del Palau, 5, 08002 Barcelona, Spain The first thing that makes Rasoterra an awesome vegan joint is their love of food. It’s not just a boring vegetarian restaurant and that is a huge statement to make. The team behind Rasoterra are foodies and it shows in their wonderful menu options which for Barcelona is really good value for your euros. Their seasonal tasting menu is a great way to start and just advise you don’t want any alcohol in your dishes either. Al Mustaqbal Street, City Walk Boulevard Vegan and Dubai are not two words I would normally put together, but you’ll be surprised at how many places are becoming plantbased in their dining experiences. Bareburger is a great burger joint if you’re in a mixed group of eaters. Its menu is packed with vegan, gluten-free and meaty options so everyone can have their fill. The Beyond Burger contains a fake meat patty that’s so realistic it even ‘bleeds’ beetroot blood! Sydney - Bad Hombres 40 Reservoir St, Surry Hills NSW 2010, Australia Did someone say animal free? Bad Hombres is a Surry Hills establishment who make Mexican food go loco. Word of warning, it’s a bit of a crazy joint, so if you’re looking for a quiet laid back place to eat, move on. However, the food is on point with an array of inventive and quite mind blowing vegan dishes. Just be sure to go in with an open mind! This Michelin Bib Gourmand winner on Peck Seah Street serves up a curious mix of Thai and Peranakan vegetarian dishes. Their motto says “If plant-based ingredients could be creatively put together to achieve great taste, more people around the world would be happy to embrace quality plant-based food in their everyday lives”. Whole Earth does just that, with an array of traditional dishes you can try meat-free from Nonya dishes to Sweet and Sour mock meat! to look after the world we’ve been blessed with. remember flying into Santiago de Chile where the snow capped Andes stood there is all it’s majestic aura as the sun rose behind it. I’m also looking forward to sharing my adventures in New Zealand, a country that is predominately powered by Hydro-electricity and home to some of the most beautiful untouched and dramatic landscapes in the world (spoiler alert for the summer edition of this magazine).